The AlkaFlow hooks up to the kitchen faucet in minutes. 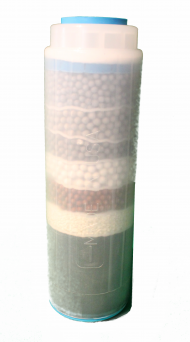 The AlkaFlow uses a multi-stage filter which removes most common contaminants found in municipal water sources, such as chlorine, chloramines, heavy metals, bad taste, sediment, and volatile organic compounds. 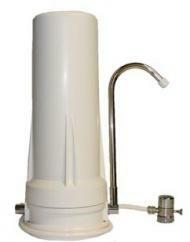 After the the filtration process, water travels through 2 layers of natural minerals to produce alkaline water. For a complete description of the multi-stage filter, click here. *These values may vary depending on local water conditions. NOTE: The performance of the alkalizing minerals is at its best when the filter cartridge is new, but it will diminish over time. To compensate, gradually reduce water flow to the unit as the weeks go by. This will increase contact time with the minerals and improve alkalizing performance.